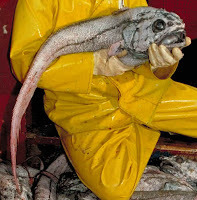 The giant grenadier is a large rattail fish and the only member of the Albatrossia genus. This strange, scary looking fish can be found in the north Pacific from northern Japan to the Okhotsk and Bering seas, east to the Gulf of Alaska, and south to northern Baja California located in Mexico, at recorded depths starting from 140 m to 3,500 m. Most of the specimens caught for surveys or as a bycatch are female, indicating that males reside in deeper depths than females do. The giant grenadier can reach a maximum length of 2.1 m (about 7 feet), however their average size is only 80 cm. The species (similarly to all rattails) has a distinctive highly pointed tail. It has a low snout which is slightly protruding beyond its large mouth. It has a black or brown mouth, head and body with small scales, somewhat oblong with a prominent dark posterior border. They can outlive most fish species, with the oldest specimen ever caught being 56 years of age. They are oviparous animals (they lay eggs). The giant Grenadier has yet to be evaluated by the IUCN. However, because of their great abundance they are not believed to be threatened or endangered. - Some researchers believe that what we call giant grenadier may actually be comprised by more than one, similarly looking species. 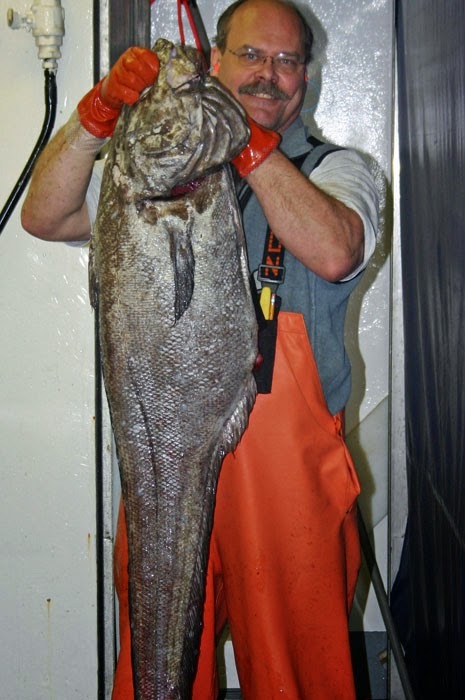 Recently, scientists on trawl surveys in Alaska noted two distinct morphs of giant grenadier. One has a much larger eye than the other. - Their meat has an unpleasant taste due to its soft texture and high moisture content. It's also poor in protein.